Join us as we set aside time each week to pray between Easter and Pentecost. 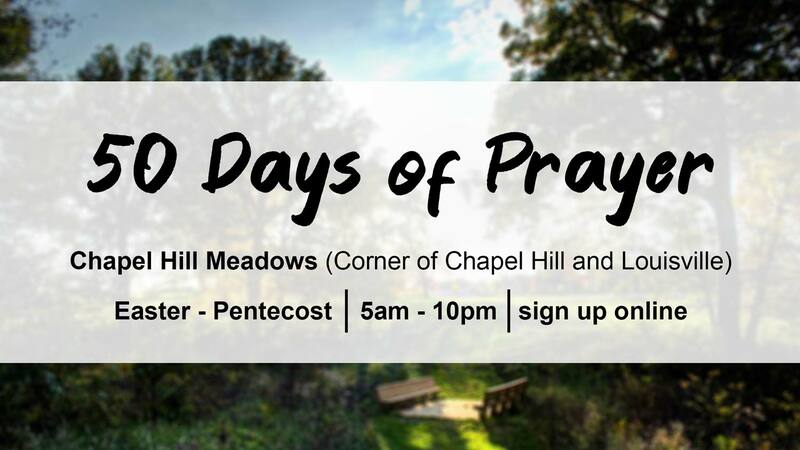 We encourage everyone to sign up for a time that you can come out with a group or individually to pray on the church property at Chapel Hill and Louisville. The time slots are an hour, but you are free to pray for as little or as much of that hour as your schedule allows. While at the property there is a variety of ways you can pray; we have prayer paths, side walks, you could sit in your car or sit in the grass. We hope you will carve time out of your schedule to join us in spending time with God through prayer this spring! Childcare: There is no childcare for these prayer times.